The headquarters of the Church of Jesus Christ of Latter-Day Saints has announced the construction of the first temple in Spain! (Click here or on the picture above for a more detailed view of the architectural rendering.) Current indications are for completion sometime in March of 1999, and our reunion is scheduled for 19, 20 and 21 March. 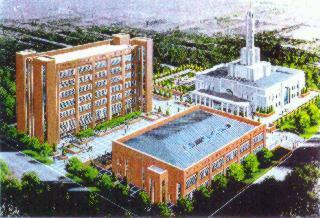 Click here for a view of the planned temple campus, including an interstake center and a missionary training center. 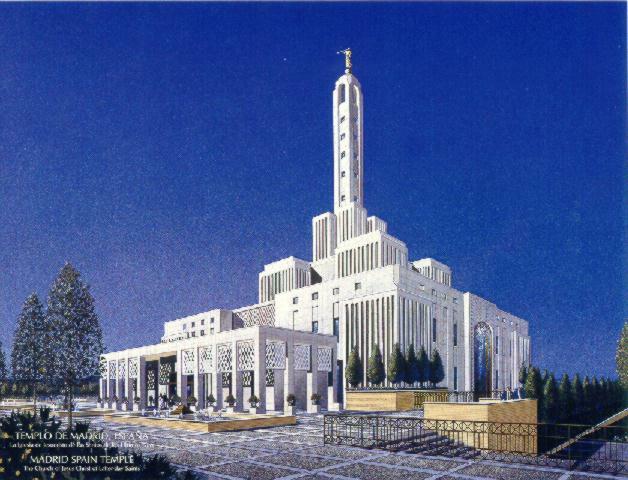 Several members of the Spain Mission, including President R. Raymond Barnes, have indicated a desire to travel to Spain and to attend the temple dedication ceremony. A reception is planned for Friday the 19th. It looks almost certain that the best dedication ceremony for us to attend will be on Sunday 21 March. Family Name                          Adults   Children   Email? If you want to come, please send email or postal mail to Bob Bosen or John Muir (addresses at the end of this page) and we'll add you to this list. The more the merrier! We've recently learned about a policy change that will require us all to obtain a special, extra recommend in order to attend a temple dedication ceremony. You'll need to write a letter to Salt Lake City, and you'll also need a letter from your bishop. The steps are detailed in John Muir's letter of January 1999, which is available for downloading from a link at the bottom of this page. Our reunion committee has plans for the evening of 19 March (with Spanish members), 20 March (for the missionaries), and 21 March (dedication ceremony). See John Muir's letters at the bottom of this page for more details. A lot of us are thinking about being in Spain for 7 to 14 days total duration. Some have expressed a desire to stay longer, but others have to get back home after only a short stay. Since everybody is going to want to see and do different things, we are not planning anything else other than to wish everybody a happy stay wherever they go beyond the gathering in Madrid. Salt Lake Travel has many years of experience with this kind of thing, and have said that they are willing to work with us for whatever is needed. Several of our missionary companions have contacts in the travel industry, and if we hear of any great travel deals, we'll describe them here. I'll publish some of the travel schedules and prices here as soon as we get a few people locking down their tickets, so everybody can know how this shapes up. As of this writing in mid-January 1999, several airlines are advertising very good rates. It's time to get those tickets booked! Too early to tell. I am assuming it's every man for himself unless and until I hear something different. The committee is making some efforts through our contacts in Spain for good quality recommendations at reasonable prices. As we learn options, we'll describe them here. But don't wait for us! Everybody must care for their own reservations. This will depend on a number of factors, and it's still too early to predict. We are assuming that by booking well in advance we can get bargain airfare rates. People who've travelled to Europe several times during the past few years report that they've spent anywhere from $500.00 to $1500.00 per seat round-trip. Hotels and meals in Europe generally cost about 50% more than similar accommodations in the USA. Right now, as a VERY rough approximation, you might expect to spend between $1000 and $2000 per person for the week-long trip, with hotel rooms doubled or tripled up. If we hire a tour bus for the group's children during the temple dedication ceremony we'll need to collect some group funds to pay for that. Our contacts at Salt Lake Travel have given us a prelimary airfare estimate ranging from $600 to $750 roundtrip, depending on number of people who sign up through them, etc. We do want to arrange a small group fund to cover postage and similar small miscellaneous expenses involved in coordinating the group. If you sign up for the trip, you should expect to contribute something to this fund. Figure $10.00 to $100 per person, depending on whether or not we fund one or more group activities or tours with it. Even if you can't go on the trip, your help with this fund would be greatly appreciated, and I promise to publish photos on this web page which you'll be able to view for FREE! We're seeking a group treasurer. Any volunteers? Once we open up a bank account I'll post instructions for making donations here. Early reports from Salt Lake Travel Service indicate over 100 so far ; there are certainly others who are making separate plans. We are hoping for 150. On Friday night, March 19, we plan to meet in the Quatro Caminos building from 6 to 8 PM. We'll have a buffet dinner, some light entertainment, and lots of fun. Pick up your badges, maps and schedules. On Saturday night, March 20, from 7 to 9 PM we will have a reception with Spanish members from our era. We will be joined by missionaries from the Stevens group. Friday afternoon March 19: We are checking for a "round the city tour" of Madrid for about 3 hours. Saturday March 20: We are looking for a tour that would include Segovia, Avila and El Escorial. This would be great for first time visitors to Spain. These are going fast. Check with Salt Lake Travel Service, your travel agent, and online to get the best tickets for you. For those of you who will be traveling around Spain, Iberia offers a ticket which entitles you to four flights within Spain for about $220. Still checking. You should check some alternatives in just in case. Travelling By Train Within Spain? Paul Olsen also says he stayed in the Palace Hotel in Madrid some years ago and "it is a great old hotel." Paul says he can get information about that hotel for interested parties. We'd still like to hear from everybody and find out who can come, who won't be going, and who would like to just stay informed. Please contact your friends from the Spain Mission and tell them about this web site and help them respond to let us know if they want to come and what we can say about their plans on the www page. If you can help with travel arrangements or postal mail correspondence, or in any other way that occurs to you, please let Bob Bosen or John Muir know. We're hoping to use this web site and email for most of our communication. Click Here to see a list of known addresses and telephone numbers for Spain Missionaries of our era. This is work-in-process and some errors are known to be present. I'm workin' on it! If you have corrections, please forward them to me. Click HERE to see a copy of John Muir's Dec98 letter, which is being sent by postal mail to everybody on our updated list. Click HERE to download a copy of John Muir's Jan99 letter, which details the steps needed to obtain your Temple Dedication recommends. This document is in "rich text format" which is readable from Microsoft Windows Write or Microsoft Word. Click HERE to see a copy of Richard Evans Jan99 letter, which gives good advice about obtaining a pass to attend the Open House. Click Here to download a copy of John Muir's letter of 28 Feb 1999 with many last-minute updates. Click Here to download a copy of John Muir's update of 28 Feb 1999 with instructions on how we can pay for the reception. The charge will be $50.00 per person, and it's important that we send payment right away. Click Here to download a copy of John Muir's update of 03 Mar 1999 with new details about obtaining tickets for the dedication ceremony. Click Here to download a copy of John Muir's update of 03 Mar 1999 with locations of hotels, metro stops, the church where we will be meeting, the temple, and the tours..
Click Here to download a copy of John Muir's update of 11 Mar 1999, which was sent to everybody for whom we have email addresses, including those that have not told us they are coming. This is a good document to print out and bring with you, as it summarizes all of the relevant schedules, locations, and events. Click Here to access the first of 4 sets of photos from Friday 19 Mar 1999. Click Here to access the 2nd of 4 sets of photos from Friday 19 Mar 1999. Click Here to access the 3rd of 4 sets of photos from Friday 19 Mar 1999. Click Here to access the 4th of 4 sets of photos from Friday 19 Mar 1999. Click Here to access the first of 4 sets of photos from Saturday 20 Mar 1999. Click Here to access the 2nd of 5 sets of photos from Saturday 20 Mar 1999. Click Here to access the 3rd of 5 sets of photos from Saturday 20 Mar 1999. Click Here to access the 4th of 5 sets of photos from Saturday 20 Mar 1999. Click Here to access the 5th of 5 sets of photos from Saturday 20 Mar 1999. Click Here to access the set of photos from Sunday 21 Mar 1999, at the Madrid Temple grounds immediately after the dedication ceremony.